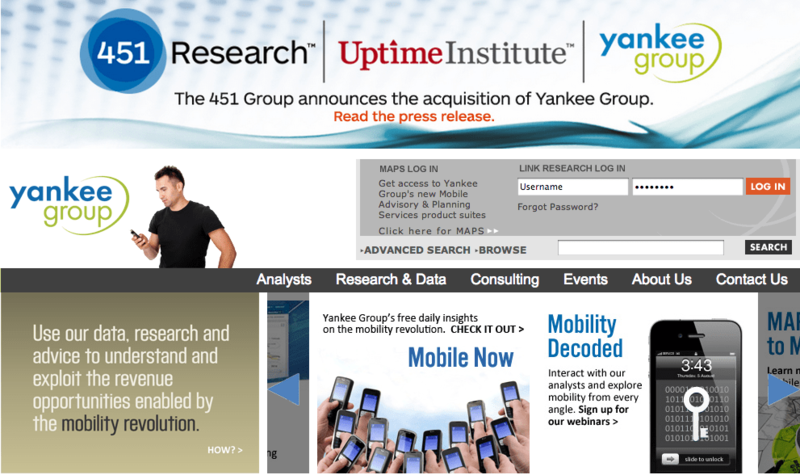 The 451 Group announced the acquisition of Yankee Group from Alta Communications on January 3, 2013. Yankee was one of the analyst industry’s most prestigious boutiques through the dot.com boom, with 70 analysts on the payroll in 2006. Today, after four successive years of contraction, it is a shadow of its former self. According to Yankee’s website, it now has a dozen full-time analysts, a data team of around the same size and several affiliated associates. If 451 had not bought the debt-laden firm, it would probably have closed. The acquisition is excellent news for Yankee, 451 and their staff and customers. The big loser is Alta Communications, a private equity firm. Howard Anderson founded Yankee Group in 1970. The firm was sold to Primark in 1996 [for an initial $34m, topped up to $51m on closure] and then to Reuters for $72.5m in 2000. In May 2004 Yankee was bought by Decision Matrix Group for around $30m. DMG was a Monitor Clipper vehicle headed by Ted Philip, which had the plan to merge Yankee with META Group. To prevent that, Gartner bought META from DMG, allowing DMG to make a good profit, revamp Yankee and in 2005, to sell it to Alta and Emily Nagel Green for $33m (more or less what they paid for it). The firm has been recapitalised since then: Alta is rumoured to have invested a further $15m to $20m. Emily Green is a talented research leader who joined Yankee with a record of success in Forrester’s European and US operations. Forrester is a larger firm with a stronger internal momentum, and Yankee lacked the organisational dynamism and customer insight to succeed with an growth project which emulated Forrester’s. Green was the entrepreneurial engine who could produce the big ideas needed to orient the research business, but as CEO she could not successfully drive the project all the way. There were notable successes: for example, Yankee bought TrendsMedia, which gave them WiMax World. Despite these successes, Yankee wasn’t able to build enough momentum. In particular, it failed to build any serious influence on enterprises. The firm’s analysts were stretched thinly and lost focus. Terry Waters replaced Green as CEO in 2010 with a mandate to slim the business’s costs, sell off assets like 4G World (as Wimax World was renamed), reposition the value proposition around mobility and prepare it for a sale to a strategic buyer. Green sadly left the business at that time, and since then the research team has lost some of its best analysts. Despite a strong Q4, Yankee’s revenues have fallen year after year for several years. Yankee was offered to more than one firm, but the loss of clients and analysts made it hard to see a strategy for Yankee to recover. Its brand is much weaker than it was. To some degree, Yankee tried to emulate the Forrester model and failed. Waters has made difficult choices in a highly constrained environment, but the damage was done. As a result, Alta is now walking away with close to nothing. Yankee will continue as an independent division of The 451 Group. Waters will remain at Yankee. No staff are expected to leave as a result of the takeover. Yankee and 451 are unsurprisingly optimistic. 451 is a better partner for Yankee, in that it understands the operations of an analyst firm and the two firms share an appetite to be analyst-led. Through 451, Yankee will be able to obtain some modest savings with overheads. The most valuable resources are the client relationships. While 451 feels that Yankee’s data, and data analysis approaches, are valuable it’s clear that most clients have not seen it the same way. Client retention is in the mid-80 percent, and contract values are under pressure across the industry. 451 can’t confirm any numbers, but they confirm that it paid a modest amount for Yankee and will assume Yankee’s liabilities as part of the deal. Compared to the cost of recruiting a similar number of people it’s a bargain – and that low investment reflects both Yankee’s past financial performance and The 451 Group’s appetite. 451’s M&A recent experiences with the Uptime Institute and Change Wave have been broadly positive (as was Tier 1 Research), and have unlocked substantial revenue growth. There’s a shared major emphasis on mobility as an enabler of digital infrastructure: that’s the core opportunity for Yankee, and it’s great that 451 and Yankee are investing to build it. They are looking to fill some gaps in the analyst team, invest more in marketing and discuss with colleagues in The 451 Group to identify new, hot, coverage areas. There are numerous opportunities for co-operation: for example cross-selling (even where there are shared accounts, the clients are typically different)), and using 451’s events. Some of these are, at this early stage, admittedly aspirational but they point in the right direction. As a whole, it’s excellent news for Yankee’s customers and analysts that 451 has bought it. Both 451 and Yankee emphasise that there will be little immediate change at Yankee. I think that’s a mistake. 451 needs to have a more hands-on approach, to actively manage its investment, and should really consider integrating Yankee into 451 as fully as possible. Right now, 451 has a better brand name than Yankee. Rather than try to introduce the Yankee brand into the enterprise market, for example, 451 could consider how 451 can strengthen its brand by taking Yankee’s insight to enterprise customers. While Yankee has been cut down to the bone, the reality is that there are not enough clients who buy into its value proposition. While acquisition by 451 gives stability, it doesn’t solve the fundamental problem – not enough people want to buy what Yankee has to sell. So far 451 doesn’t seem to fully recognise that Yankee needs a substantial investment to build its mobility offer and to replace lost analysts like Eugene Signorini. 451 thinks there is a thirst for the sort of insight Yankee has to offer. It’s early days, but none of the other investors that looked at Yankee found a way it could find and meet that demand profitably. 451 needs to play the decisive role in solving that problem. PS. Howard Anderson is now teaching at MIT where his subjects include Managing in Adversity. My thanks go to him for the clarification I’ve added above [in brackets]. PPS. Also check out Dave Michel’s article. After reading it, I’m wondering if Monday morning at Yankee will be like Glengarry Glen Ross. ← Is analyst relations an extension to public relations? Pretty nice piece Duncan. The sad fact is that the marketing and sales arms of Yankee had been gutted and despite efforts from guys like Gene, they were never able to amass enough enterprise customers to pay the bills. While Emily, as bright as she is as an analyst, was not able to operationalize growth at Yankee, I always felt she was to handicapped by her board and not because of any operational deficit in her DNA. When the board brought in Waters ( after a new capital infusion ) I didn’t think it was a good fit. It still isn’t and I’d be very surprised if his tenure lasted beyond transitional needs. Buying Yankee at or near the ACV plus it’s liabilities is a really sad ending for a company who was so dominant in mobile well in advance of the explosion in the sectors that we now witness. I think 451 will bring great leadership to the talented analysis bench they’re acquiring but they will still need to find away to create growth against Gartner / Forrester on one side and well funded alternative business models like those being used by the Research arm at GigaOm and other boutiques on the other.